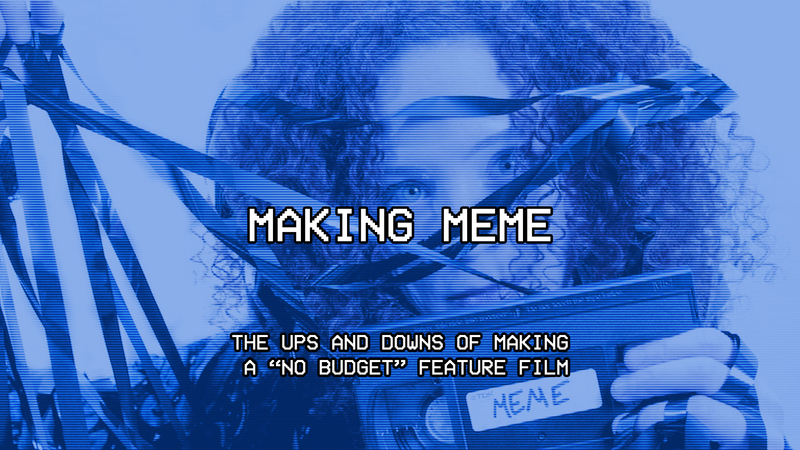 There are two parallel searches happening in Meme, Jennifer’s search for the creator of the surreal “Meme” mashup tape and her boyfriend Tommy’s search for a rare horror VHS: Beneath the Black Moon. The search for Beneath the Black Moon became part of the core of the film after the crowdfunding campaign was unsuccessful. I had dug more into the actual VHS collecting community and decided that while I probably wouldn’t properly reflect that community in the film, I could be much much closer than the original version of the script, which didn’t do a very good job of that. Tommy looking online and in person for a rare tape seemed a way to do that. Specifically, the idea for Tommy’s search came when watching Adjust Your Tracking: The Untold Story of the VHS Collector, a 2013 documentary on VHS collecting and collectors. In the film there is a story about an eBay auction that went a bit wild for a difficult to find tape called Tales from the QuadeaD Zone. During a screening of the documentary with a Q&A with two producers of the film they discussed this auction that resulted in someone paying $665 for the tape and how one of the producers had found the tape some months later for $1 in a New York video rental shop that was closing. It occurred to me that something like that might be a good way to reflect that community better in the film. I didn’t want to have Tommy looking for Tales from the QuadeaD Zone, though, and we’d already toyed with the idea of having a horror film-within-the-film and a friend and I had discussed the possibility of him shooting it. In the version of the film we were crowdfunding I had talked to another friend about shooting some silly videos to include, which I still have, but they didn’t quite work for the new direction of the film. I wanted Tommy to be looking for a cheesy “satanic panic” low budget horror film. I didn’t have the plot, but by the time we were preparing to shoot I had a title: Beneath the Black Moon. The title Beneath the Black Moon was me feeling around looking for something that would sound sufficiently cheesy to fit the idea. The title was inspired by Panos Cosmatos’ Beyond the Black Rainbow and Louis Malle’s Black Moon. The final film resembles neither of them but rather a mashup of silly ideas inspired by low budget VHS horror. When we started shooting Tommy’s scenes when he’s searching for Beneath the Black Moon, the film hadn’t been written, yet. All I had to show Shivantha Wijesinha about the film was a poster and a faked VHS box. As we approached the hiatus we were taking in summer of 2015, I knew we had to shoot the film, because we’d have some breathing room to do it. I wrote a ten page script which I knew we wouldn’t use all of in Meme. I had included one scene in particular to parallel some of the plot of Meme, but other than that I wasn’t sure how much of this video we wanted to see. The script was written with the idea that the audience is only seeing parts of the full film, but enough to glean the whole story. We referred to it as “just the good parts,” as though someone had taken the original film and recorded only the parts they liked to a tape so they could just watch that. Again, I was inspired by the VHS community and an event where Jaws 3D had been presented this way. With the script and a rough idea we’d be shooting over a couple of days in the summer, I started to recruit a separate team to shoot Beneath the Black Moon. Art Director Nicole Solomon joined me as a producer for this film. Assistant Camera Jeanette Sears agreed to shoot the film. I then recruited a handful of people from another production I had been working on at the same time Maybe Sunshine. Maybe Sunshine is a web series starring musician and filmmaker Lisa Hammer. The series is about her attempts to get back on the music scene after a decade outside the scene. My producer/assistant director, Carolyn Maher, and I were helping produce that series at the same time we were producing Meme. Through late 2014 and 2015 we were often spending our weekends working on one project or the other. From Maybe Sunshine I recruited Lisa and her husband Levi, who directed the series, as a pair of villains for Beneath the Black Moon. They also acted as co-producers of Beneath the Black Moon, helping with logistics and some of the art and wardrobe process. I put out a casting call and reached out to some people I knew and we recruited a handful of actors game for this over-the-top VHS horror homage including Zac Kish, Annie R. Such, Lizzy Andretta, Sarah Albonesi and comedians Ginny Leise to play our virginal heroine and Alia Janine to play a seductress witch. Karen Fleisch, who had already come in to play a friend of Lauren A. Kennedy’s character in Meme joined us for this project providing wardrobe, which she also did for Maybe Sunshine. The plan for shooting Beneath the Black Moon was to knock out the bulk of it in two days with one extra day where we’d just shoot some gore inserts with minimal or no actors. We shot the film on July 11th and 12th of 2015. Our first day was a bit intense. We crammed all of the indoor shots into a single day. To do that we turned producer Nicole Solomon’s apartment into a little studio. Her living room became the dark lair of our campy satan worshipping witches as well as a makeshift green screen studio to create an 80s Ken Russell style surreal green screen sequence. Her bedroom became our heroine’s bedroom. I have developed a mild set superstition at least partly due to this first day of shooting Beneath the Black Moon. Never say out loud you are ahead of schedule. Ever. We were way ahead of schedule on our first day. I was excited about that. We were zipping through all of the early parts including a shot for shot recreation of the final scene of Scanners for the final scene of Beneath the Black Moon. Then, we had to do the green screen part. That took twice as long as I’d anticipated, at least, and shifted us from being ahead of schedule to being behind. We got everything we needed but it took quite a bit longer than we hoped in the end and part of me will always suspect this is due to me mentioning out loud that we were ahead of schedule. Day two was our exteriors day. Simple shots outside. It was supposed to be an easy day and when we were actually shooting, it was. I dropped the ball on planning the logistics of the shoot in a sensible way. Our first shots were in Brooklyn in a neighborhood that looks fairly suburban. We managed to get the two walk and talks we needed pretty quickly. We then lost most of the day to driving out to woods in a park in New Jersey to shoot some chase shots and that’s where I dropped the ball. Company moves/location moves are tough even when you can fit about 90% of the cast and crew in one van with the gear. Minimizing distance and not driving through the middle of Manhattan in the middle of the day to get to where you’re going for the shoot is ideal. I should have explored Brooklyn options. Honestly, we probably could have shot in a wooded area in Prospect Park and gotten all we needed and saved everyone a bit of time. Doing more pre-production legwork and thinking about these logistics would have helped a lot. Still, what we got is great and works very very well for the film. We got the whole 10 pages shot in those first two days with the exception of a few inserts we saved in order to streamline the days. A month later on August 13th 2015 I got together with Nicole Solomon and Jeanette Sears and the three of us had fun with fake blood, mannequin torsos, and some fake fingers and guts. We had a list of things to get and then we just played around. Beneath the Black Moon cut together pretty quickly and it served as a test bed for some of the effects we were considering for the rest of Meme. We publicly released a version of the film on YouTube for Halloween 2015. One of the other reasons we shot a full short for this rather than to just shoot the few parts we needed is that it could then be something on its own to compliment Meme. People curious about the film within Meme could see more. People who caught the short film might then be enticed to see Meme. They could feed into each other. Next time we’ll discuss the final day of principal photography for the film, which would also be entirely in Nicole Solomon’s apartment.